My favorite thing in the world is receiving messages from people who have found success with online business through a course I've recommended. Every morning I wake up with messages in my inbox asking me questions, advice or for guidance and I'm always happy to do what I can to steer them in the right direction as it was little nudges and reassurances like this from people who were already more successful than me that really helped keep me motivated when I first got started. Unless you're already a member of one of the courses I recomend, you probably don't ever see success and if anything, if you're on a public forum, reddit or anywhere else you only see people who say nothing works or how nothing is worth trying. I'm on the other side, as like most successful people I don't spend any time hanging out with people who haven't even gotten started and I only see the people who are at least trying or have already been successful. But since I know a lot of you aren't there yet, I wanted to share a sneak peak at the other side and show you how to get there. Why Are There Two Sides? It seems a bit unfair that on one side of the mountain it seems treacherous, hard to navigate and lonely, while for people who are already successful, everything seems easy. Unfortunately, it's true which is why the rich get richer and the poor get poorer. Honestly, most people who are making money have no incentive to go back to the other side of the mountain to help people starting out, and unless they have a financial incentive to do so, they're usually too busy working on their own projects and making money to post on forums, blog, answer questions or help out people getting started. To be honest, I think most people actually do, at least for a little while, but they quickly realize that it's a waste of their time as most people don't ever end up taking action and every time you give them one helpful hint or answer, they just come back with twenty more questions even before taking action on the first. 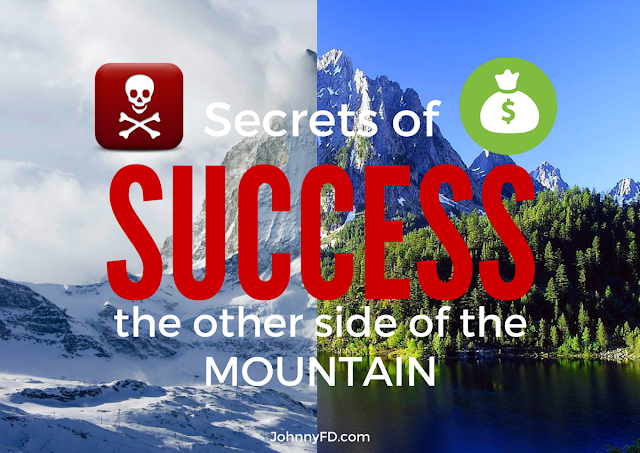 But here's the thing, we all start on the treacherous side, my goal is to show you how other people have gotten to the success side of the mountain. 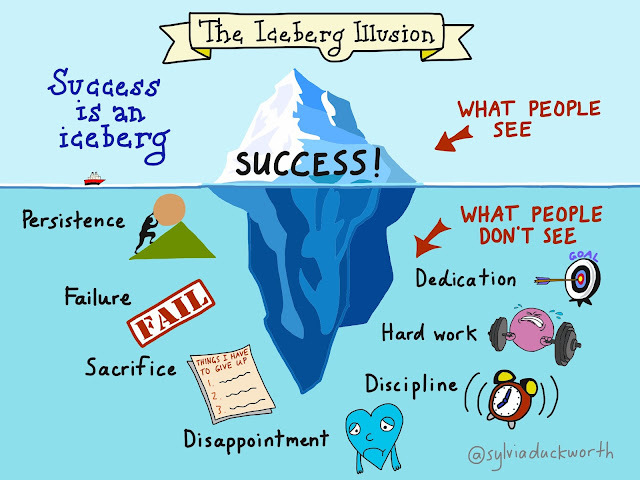 But just to warn you, the success mountain is more like an iceberg, what you actually see is only part of the journey. I reached out to you previously regarding DSL. I started two drop shipping stores using DSL; one did not work out and the other is still a work in progress. But where I have seen significant results is from applying what I learned using David Vu’s Ebay course, and it’s all thanks to you. I started recreationally selling on Ebay back in late October just to test things out. Things just took off when I decided to tackle it full time when I lost my job in mid-November. Since then, I’ve made over $50k in sales and almost $8k in profit. This is not including all the fabulous cash back bonus and airlines miles I’ve accrued! I’m nearly at the point of making what was my full-time monthly income from my 9-5 with Ebay in the next few months. This is definitely a significant milestone for me as I’ve always wanted to start my own online business, but I never knew how until I stumbled upon your blog in March of 2015. It’s been a hard journey with a lot of sleepless nights, but seeing those numbers are worth it! I’m currently looking for a VA for my Ebay stores so I can scale that business, and start looking into other ventures. Ebay is great, but the danger of Ebay closing down accounts at a moment’s notice is a real danger. Just yesterday, a prominent student in David’s course had his account closed down with no explanation. Knowing this scared me, but it also motivated me to start diversifying my income immediately. I will be purchasing your Udemy affiliate course later this afternoon, and I hope I can start making some income sharing my story (I hope David accepts affiliates for his course!!). Here are the secrets on why Maria (not her real name) is successful. She first messaged me almost seven months ago saying she was going to get started, and never gave up. When she lost her job in November she decided to take a chance and start working on her ebay store full time, which ended up paying off as she's already make $8,000 in profit and is confident that it's going to soon replace her full time 9-5 income. It was a smart move on her part going the ebay route first as she needed income quickly after losing her job. 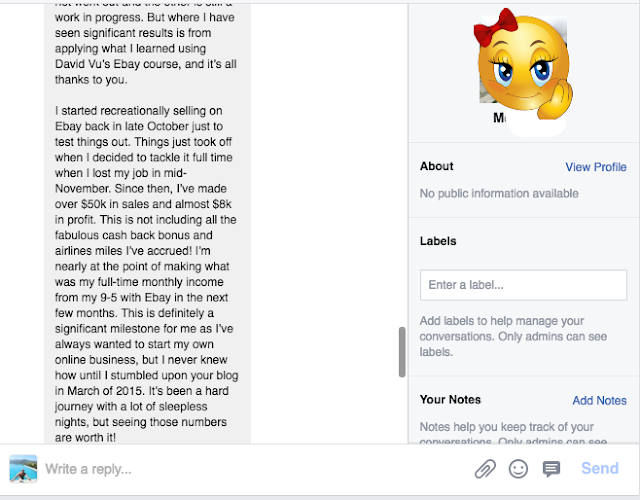 She's also really smart to have the plan to hire a VA (virtual assistant) to outsource her ebay store so she can start working on her actual drop shipping store which has the potential to be more profitable and more sustainable in the long run. Maria is a member of both David Vu's Ebay Course and Anton's Dropshipping course. My first 30 days out of the gate, and my store had $14,188.73 in Sales! I've been following Sarah's journey ever since she joined Anton's course two months ago and one of her very first posts was replying to other people's progress updates saying, "hey i'm just starting out too, let's keep in touch." A lot of people who get started simply lurk and never post. The fact that she was reaching out to other members from the start is how masterminds get formed, friendships happen and accountability forms. Even before making her first sale, Sarah started helping out other members however she could. She would use her job experience with things like design and as soon as she started having communication with suppliers for her niche, she started answering questions that other people had starting out. I truly believe not only in good karma but also the fact that when you teach others you are mastering the skills yourself. Other than that she also asked the right questions and more importantly, took action before asking another. By doing so and taking personal responsibility she has built a profitable store that will only grow from here. 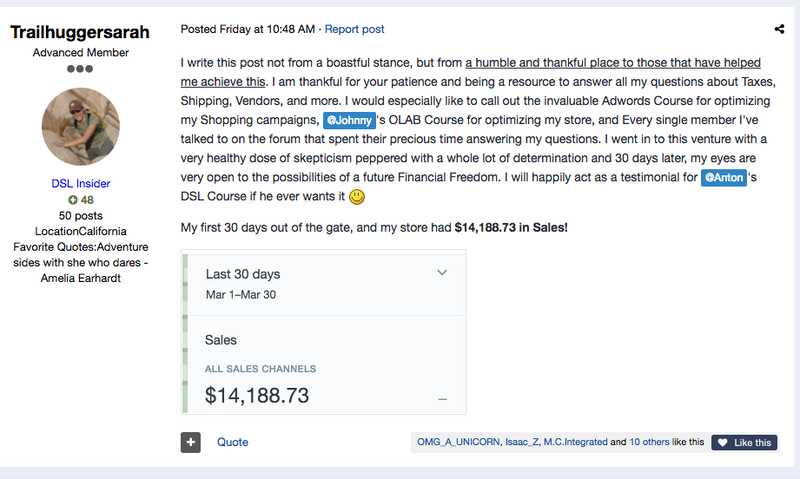 Sarah is a member of Anton's dropshipping course and my Optimize Like a Boss course. We signed up for Drop Ship Lifestyle on February 17th and after a lot of long hours setting up our store, we finally made our first sale today. :) It was a $1,700 sale! Hopefully the orders keep coming in. In the meantime we plan to keep optimizing and improving our website. A lot of people would just read the above post and say, okay, good on them, and leave it like that. But if you really analyze and breakdown why they were successful, you'll see it took them 2 months to go through Anton's course and do everything before getting their first sale. They also spent a lot of hours doing so and still plan on further optimizing their store afterwards which shows they don't have the mindset of "set it and forget it" or "get rich overnight." They have the mindset of let's put in the work required to make this a success. Knowing that and assuming these things based on previous experience, I also made sure to ask them the questions to really get to the bottom of their success as it helps other members realize they are just normal people who also struggle when first starting out. "Thanks Johnny and Ryan. Our names are Chris and Alexis. We are from San Antonio, TX. We are an Environmental Scientist and a former teacher (now a Stay at home mom of 6 month old twins and a 3 year old). We chose the name TheDreamTeam because we are striving to achieve the life of financial freedom and a location independent lifestyle. We are very excited about this new venture in e-commerce and hope it leads us to where we want to be in life. Our journey so far has been a HUGE learning curve for both of us and mind-wrecking at times. But we have learned sooooooo much. It almost feels like we went back to college again. 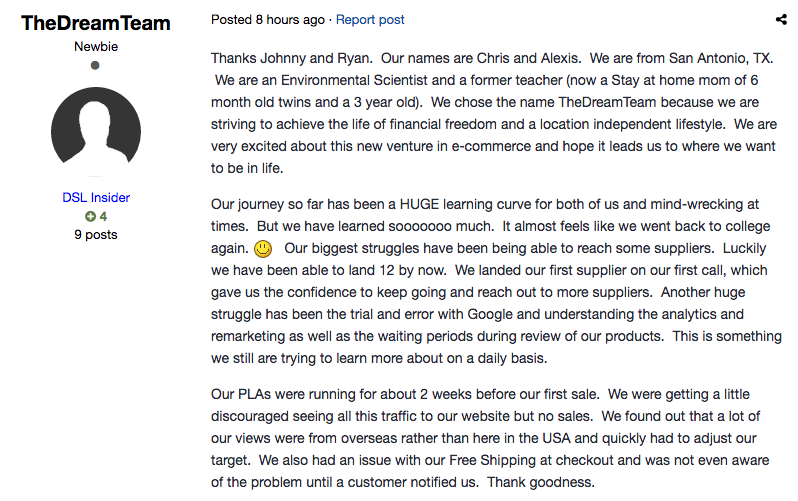 :) Our biggest struggles have been being able to reach some suppliers. Luckily we have been able to land 12 by now. We landed our first supplier on our first call, which gave us the confidence to keep going and reach out to more suppliers. Another huge struggle has been the trial and error with Google and understanding the analytics and remarketing as well as the waiting periods during review of our products. This is something we still are trying to learn more about on a daily basis. Our PLAs were running for about 2 weeks before our first sale. We were getting a little discouraged seeing all this traffic to our website but no sales. We found out that a lot of our views were from overseas rather than here in the USA and quickly had to adjust our target. We also had an issue with our Free Shipping at checkout and was not even aware of the problem until a customer notified us. Thank goodness. We set our drop ship banner with a certain promotion and saved it. Sometimes it will display our old promotion. Any suggestions to get it to keep displaying our new wording? When do you send out a newsletter to people who just subscribe? Do you do it immediately or do it when you get a good list of people? Do you do it a certain time of month if you just send out in bulk at one time (ex. the 1st of the month)? It seems that MailChimp has a Masterlist it sends to, and we don't want to be re-sending newsletters to the same people when we only want to send to the recent signups." The best thing about Anton's course is the community inside the private member forums as there are about a thousand people helping each other out inside of it. 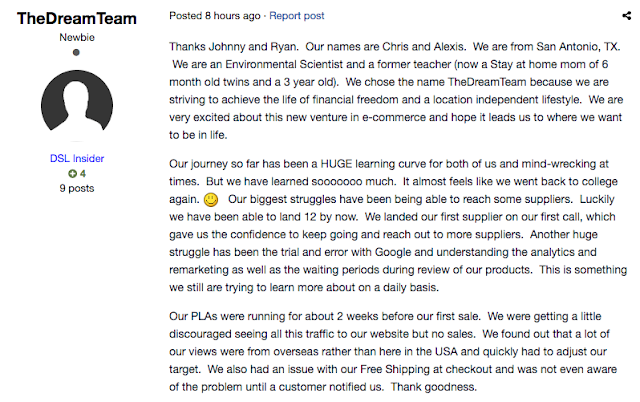 It's awesome to hear that The Dream Team is a stay at home mom and an environmental researcher as this really shows they are just normal people and not IT nerds. One of the reasons why I really wanted to share this is because their point about "going through college" again is spot on. If anything, starting a business is like getting your MBA but in real life. I've honestly learned more going through Anton's course and starting my dropshipping stores than I did in 4 years of college. It's also good to see how they have a big learning curve, had the same issues with reaching suppliers and setting up ads as these are common problems that others can learn from. Future students will hopefully read this and put it on their to do to select "USA only" when turning on their ads and not make the same mistake as well as make their sure their shipping promos are actually working. 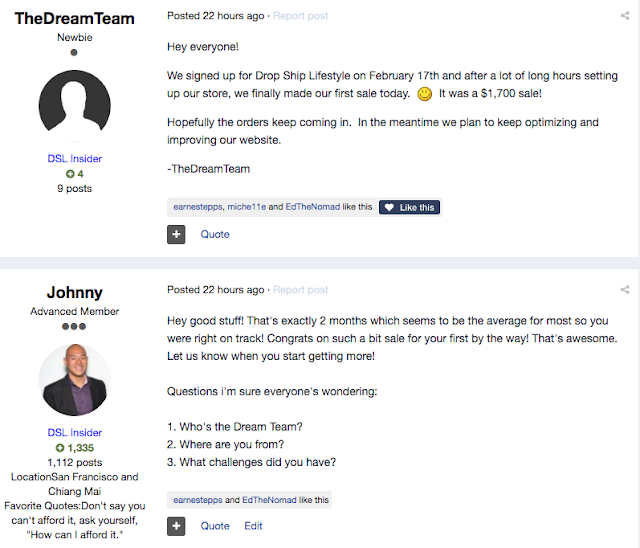 This on top of the questions they had for me which I'll answer and go into detail in their tread inside the member forums are just a few of the things that come up when starting a dropshipping store, which is why I never encourge anyone to do it on their own without the course. Sometime just messaged me their store URL that they tried to start on their own without being a part of Anton's course and honestly, there is so many little things that are wrong with it that i'm afraid if I start being nice and answering his questions, it'll end up being 40 messages back and forth and he still won't' really understand what he's doing wrong. He mentioned he has started sending facebook ad traffic to his store and hasn't made any sales yet and asked me to look at it. The answer would be, only use facebook ads for retargeting and use google ads to start and test, but honestly, that would just lead him to wasting a bunch of money running google ads to products that may or may not actually convert into profit as he's missing a bunch of other parts of the equation. This is one of the reasons why I promote Anton's course so much. It's a great resource and we're fortunate it exists. The above two stories are just a few examples from members of courses that have mentioned or reached out to me this week. Maria's was just this morning which gave me the idea to write this post and Sarah's was from a few days ago in the member's forums of Anton's' course. The reason why I wanted to share these two stories with you is because unless you're already a member of one of the courses or people are private messaging you about how well they're doing, most likely you never see these things and only hear from people online who haven't even taken the first step to get started or gave up way too quickly to be successful. I can't speak on every course out there as I'm only a member of these two, but I know that 100% if you just follow the course, stay on track and do everything David or Anton says, you will be successful. 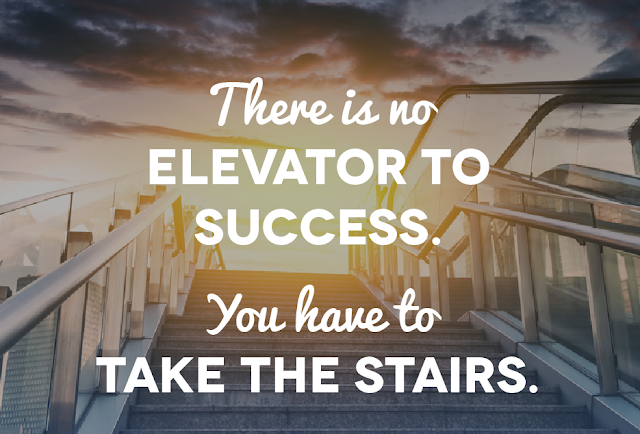 I've honestly never met anyone who earnestly gave it their all, followed the instructions without taking shortcuts and didn't give up who wasn't successful. If you ever need some guidance on how to get started, leave a comment before or feel free to message me on facebook and definitely let me know when you start seeing success, make your first sale or replace your 9-5 income as I love hearing it! If you are a resident of the U.S., Canada, Australia, Holland or Scandinavia you should sign up for Anton's Dropshipping Course as there are a ready a ton of people ahead of you who have figured it out, documented what they've done inside the member's forums and it's very realistic to start making sales within 2 months and build a profitable ecommerce business. If you're from most other countries it'll be the wild west where you'll have the potential to earn a lot of money kind of like if you started an ecommerce business in the U.S. back in 1998 but you'll have to figure out a lot of it on your own. For those people who would rather follow a course that will be a lot easier or if you don't have enough money to sign up for Anton's course just yet, my suggestion would be to go through David Vu's Ebay Course as it's much cheaper to get started and can be done worldwide regardless of what country you're from. I hope these two success stories help keep you motivated and my breakdowns show you a bit of what it actually takes to see the other side of the mountain. It's worth the journey, hardwork and dedication, I promise. Thanks for all the encouragement I have received from you in all your great resources. Hey Dan, i'm super happy to hear that! Congrats on quitting your job and replacing your 9-5 income online!! Can I ask what you're doing? The job was usually just one day a week, but it was the longest I have ever been an employee by the same company and I am 56. I have started many one man self-employment companies, but online is by far the best. I have several websites, and a YouTube channel. The majority of my income is from AdSense and subscriptions. Your Nomad Summits were a big help for me and I love the Pod casts too. Nice stuff Dan! Really glad to hear you're doing well. Feel free to give your Youtube channel a shout in the comments so we can check it out. Glad you enjoy the podcasts too! Good Stuff some extra inspiration to see how many other people are achieving the dream. All coming soon as my blog grows.